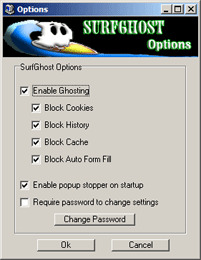 SurfGhost is an advanced popup blocker and privacy protector. It erases your Internet tracks and blocks annoying Pop ups. It allows you to choose what aspects of your surfing experience you want to keep private so no one except you can view your Internet activity. Also, it can delete cookies while you surf, protecting your privacy.